As your Washington, D.C., & Arlington endodontics professionals, Fidel Dental Group knows what’s happening inside your teeth. Because there are so many elements that make up your tooth, it’s important to have a doctor who knows what to look for. Dentin, root canals, soft pulp tissues, and blood vessels are all protected by the enamel, which is why it’s important to take care of your teeth with proper hygiene, but sometimes the damage just happens. What Causes Damage and Pain? Tooth Decay – If you go for a time without having your decay treated, it could cause the pulp tissues to become infected. The infection often runs into the root canals and the nerves, causing severe pain to the tooth and surrounding teeth. Keeping up on your regular, twice-a-year exams, and having cavities filled as they are found, can help you avoid this situation. Dental Trauma – Trauma to a tooth can come in multiple forms. You may have an injury from sports or have had multiple dental procedures completed on a single tooth. In both cases, the tooth experiences trauma, which can cause it to become infected. You can’t exactly predict and prevent this from happening, but you should always pay attention to any pain in your mouth and have it checked out. 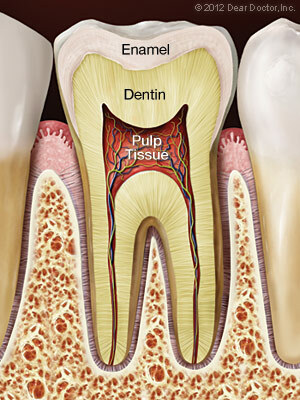 Although we perform multiple, the most common endodontic treatment we perform is a root canal. Patients who need this procedure done will receive a local anesthetic. A tiny hole will then be made on the surface of the tooth. This hole goes through to the root canals and pulp chambers. Through these holes, the endodontist will remove the infected tissues. Once the passages are cleaned, the doctor will make sure they are disinfected and then will fill them. Following the filling, a sealant will be placed. After a certain amount of time for recovery, a crown will also be placed. In some situations in which the structure of the tooth is still very strong, it may only need a typical filling. If you are experiencing pain, there is a solution. As your endodontic professionals, Fidel Dental Group is here to help. Schedule your exam today to have the doctor take a look at what’s ailing you. Contact us in Arlington at 703-575-9899 or in Washington, D.C., at 202-362-7413.